Irregular aggregate of greatly elongated crystals with a spindle-like shape, most of them doubly terminated with very acute pyramidal terminations. 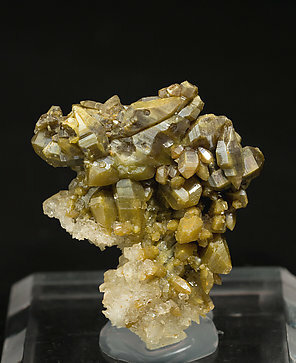 The crystals are brighter than usual for Los Lamentos and have a dark greenish-brown color. 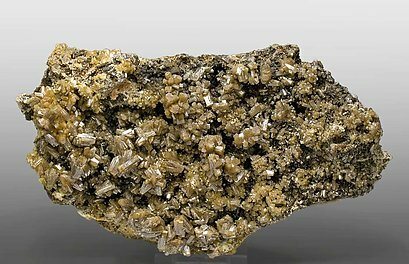 These Vanadinites, whose arsenic content is quite higher than usual, are well known as the endlichite variety. Huge crystal size on this arsenical Vanadinite (more Arsenic than in normal Vanadinite but not enough Arsenic to make it Endlichite). Its color is clearer and more esthetic than the usual material. The crystals show well their morphology. Minor black Mottramite on the bottom of the crystals too. 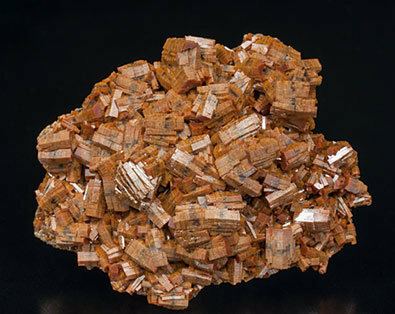 Isolated and groups of arsenian Vanadinite crystals with very well defined and slightly curved faces and edges, most of them doubly terminated. 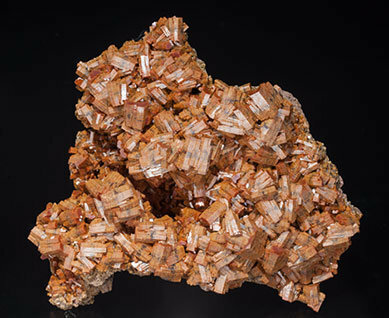 The Vanadinite crystals have an unusual tan color that contrasts nicely with the dark surface of very small Mottramite crystals coating the matrix. A classic for Touissit. 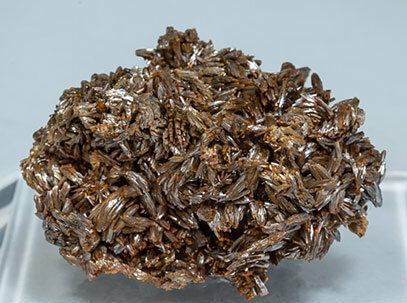 Groups of doubly terminated crystals with slightly curved faces and edges, typical brown color and very bright. 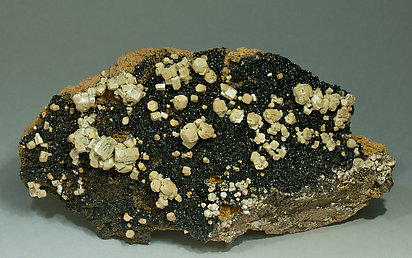 On matrix, with small black crystals of Mottramite coating the vugs. 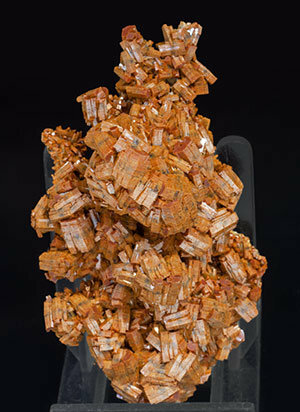 Aggregate of doubly terminated crystals, bright, with very well defined faces and edges and with a very unusual color, between orange and cream, and with a dark colored stripe in the center of each crystal. The sample was collected 200 meters deep in the old abandoned shafts at the ACF mine. Due to very difficult access and collecting, future recovery of such pieces is not expected. 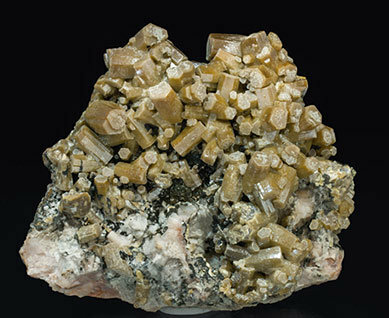 Aggregate of doubly terminated crystals, bright, with very well defined faces and edges and with a very unusual color, between orange and cream, and with a dark colored stripe in the center of each crystal. The sample has been collected 200 meters deep in the old abandoned shafts at the ACF mine. Due to very difficult access and collecting, future recovery of such pieces is not expected. Aggregate on very little matrix of thick tabular crystals that are bright, with very well defined pinacoidal faces, parallel and skeletal growths on some of the prism faces. 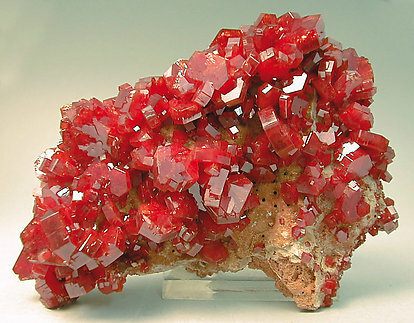 The crystals are considerably large, have an excellent red color, vivid and uniform. Of the best quality for Mibladen. 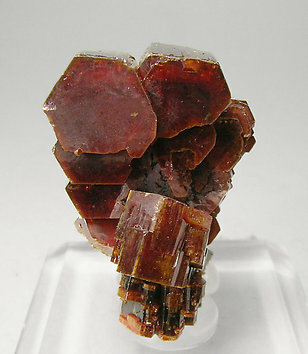 Large crystal size in this powerful Vanadinite on matrix. Superb color and brilliance on this hyper esthetic specimen. It comes from an old find and I have been able to obtain it because of the new status of the Vanadinites. 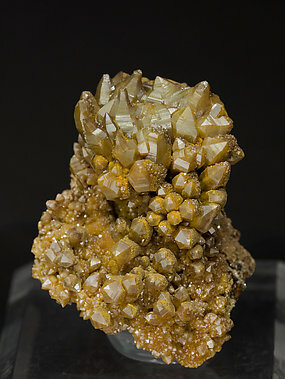 Aggregate of doubly terminated crystals, bright, with very well defined faces and edges and with a very unusual color, between orange and cream, and with a dark colored stripe in the center of each crystal. What color! 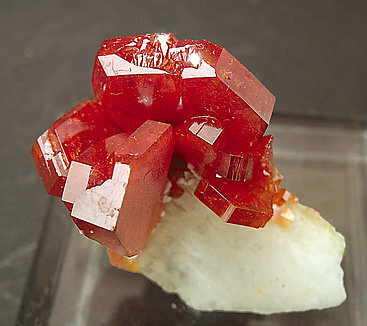 A very lively red that contrasts well with the white Baryte matrix. 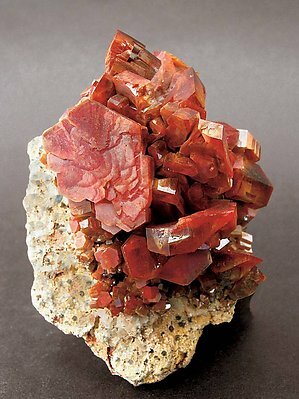 The Vanadinite crystals are undamaged on all their faces, and, because they are aerial, very visible. A novelty at Tucson 2012. 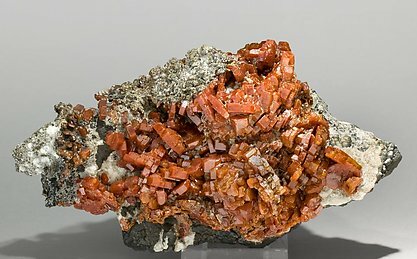 Unusual crystalline shape for the Vanadinite, whose aggregates are formed by dipyramidal crystals of very well defined faces and edges. They show a creamy color and are on matrix. A novelty at Tucson 2012. 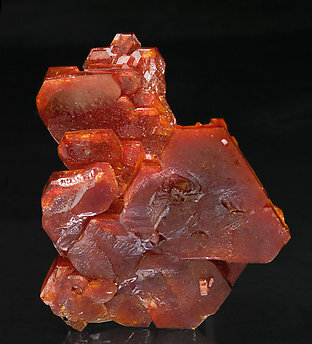 Unusual crystalline shape for the Vanadinite, whose aggregates, very aerial, are formed by crystals with a prism and an acute dipyramid with very well defined faces and edges and are on matrix with small crystals of Calcite. They show a creamy color and are on matrix. 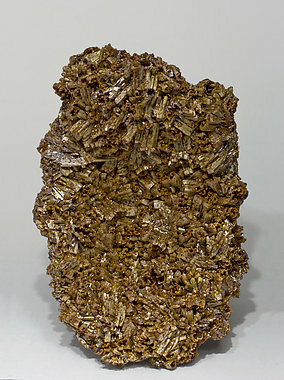 Initially one might think this is a single crystal, but really is a group of crystals sharing the upper face. 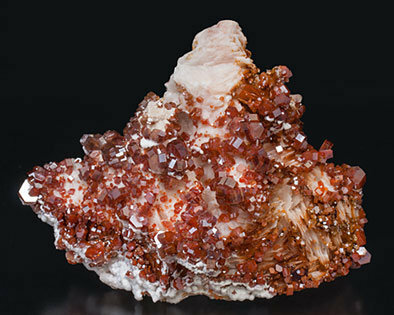 While this face shows the vivid red color typical of Vanadinite from Morocco, the lateral view (corresponding to the prism faces) reveals a range of tones from intense orange to the most spectacular red. An undamaged floater of nice color. A good example of the rare beauty of the Vanadinites from Coud'a. 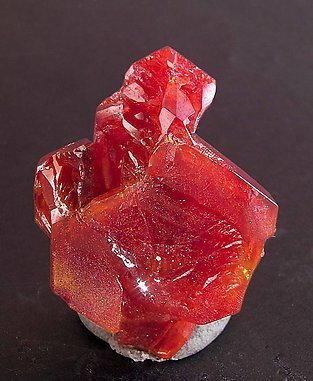 Aggregate of crystals, large for the species, bright and with an intense and vivid red color. They have poorly developed prismatic faces, one of their terminations is polycrystalline, and with predominating pyramidal faces. The back sides of the crystals are almost flat. 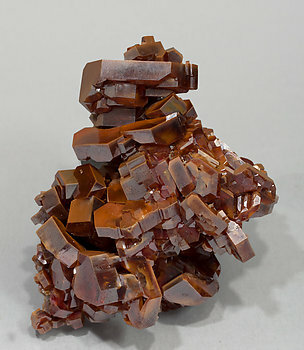 Very aerial group of doubly terminated crystals of good size, with parallel growths and deep color with orange-brown reflections. Group of tabular crystals, some showing a clearly hemimorphic shape with very well marked pyramidal faces. They are very bright and have irregular color zoning. 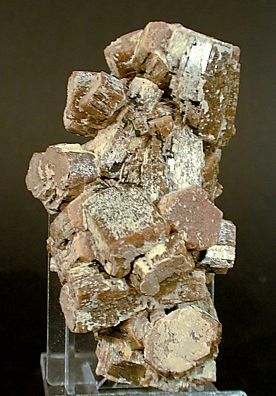 Aggregate of crystals with parallel growths, hollow terminations and typical brown color. 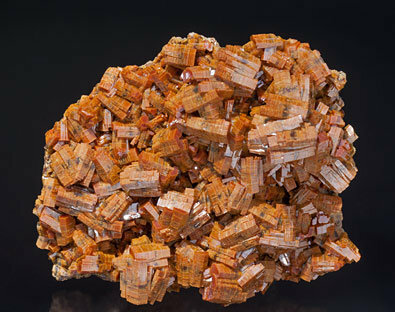 In spite of its color this Vanadinite should not be confused with the arsenical Vanadinite (endlichite variety) from Los Lamentos. 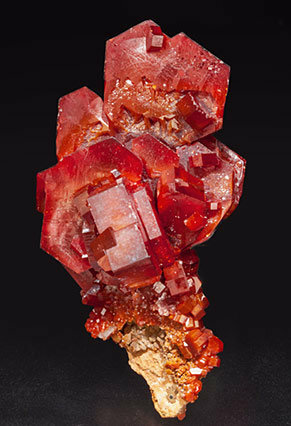 Irregular aggregate of red tabular crystals with well developed pyramidal faces on one of their terminations, with the opposite termination clearly flat. They are on matrix, with botryoidal growths of Goethite and an unidentified white carbonate. The mine is a very uncommon one and it supplied a small amount of significant samples for only a short time. Crystals have considerable size and good color. They show the typical morphology of Taouz and are spread on matrix, which allows one to clearly appreciate their excellent development. 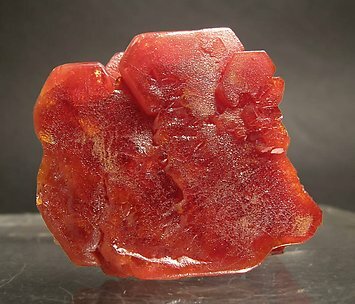 Vanadinite (arsenian variety) crystals, many of them doubly terminated, with very well defined faces and edges, a creamy color, clearer and brighter than usual with this kind of Vanadinite, and on a Dolomite matrix. Associated on the matrix are small black Mottramite crystals. 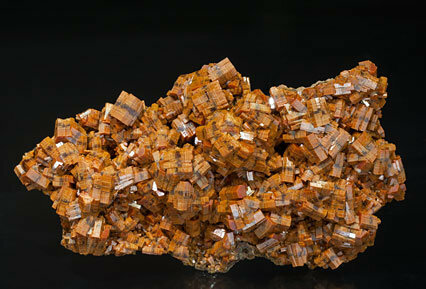 These arsenian Vanadinite are currently accepted as a Moroccan classic. 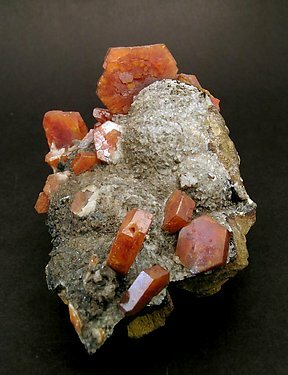 Aggregates of very well defined mostly tabular Vanadinite crystals that are translucent, bright, have a very deep color and are on a matrix of white Baryte crystals with small white Calcite coatings.